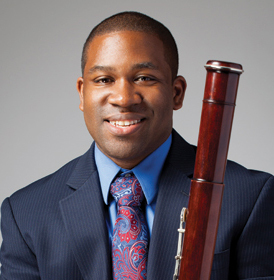 Dantes Rameau earned performance degrees in bassoon from McGill University and the Yale School of Music and did postgraduate study in his instrument at Carnegie Mellon University. But his ambitions changed from performance to outreach after he spent a year on an El Sistema fellowship and learned about the Venezuelan model of bringing classical music to children in underserved communities. In 2010, the bassoonist turned entrepreneur to co-found the Atlanta Music Project, which provides tuition-free music education in mostly black neighborhoods in the city’s south and west sides where public school music programs are limited. AMP has grown from 19 students and one program site in the first year to 350 students, grades K-12, in five sites in 2018–19; from a first-year budget of $150,000 to $1 million. The organization has a staff of 10 along with 50 teaching artists, and its student groups give 40 concerts a year. Its young players have been accepted into Georgia All-State music ensembles, and seven participated in a youth orchestra festival in Mexico City, with Gustavo Dudamel conducting. Rameau has raised $5 million from corporate donors such as Bank of America and Chick-fil-A, and AMP has partnerships with the Atlanta Department of Parks and Recreation, Clayton State University, and the Atlanta Symphony Orchestra. Collaborations with Atlanta’s thriving hip-hop and pop music scene have included performances with rapper T.I. and R&B star Monica.